What If Your Vision Insurance Helped More People See? RANCHO CORDOVA, Calif., Feb. 26, 2015 /PRNewswire/ -- Did you know one in four children has an undetected vision problem? While ten million American students have vision conditions that can impact learning, a simple comprehensive eye exam can help ensure that correctable visual problems don't become permanent. 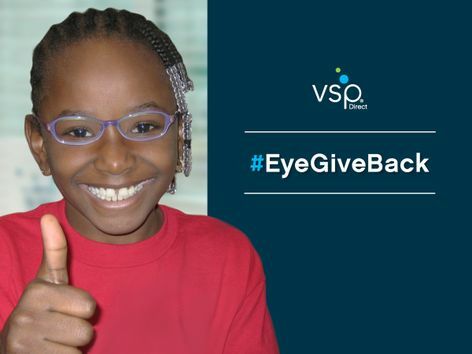 To help children see their full potential, VSP® Vision Care, the largest not-for-profit vision benefits and services company in the U.S., has launched #EyeGiveBack. Now through June 30, 2015, when a VSP Direct™ individual vision insurance plan is purchased through VSPDirect.com/EyeGiveBack, VSP will donate an eye exam and glasses to a child in need - up to a retail value of $1 million. "Our mission is to help people see and we're excited to share an opportunity with consumers to not only provide a benefit for themselves and their families, but also help a child in need," said Ken Stellmacher, General Manager of VSP's Individual Plans, "Through #EyeGiveBack, we're increasing the impact of every vision plan purchase by amplifying how many people can experience life to the fullest."